Today's weather is a perfect barometer! Experience a lush life on grounds designed to bring Mother Nature right to your door. 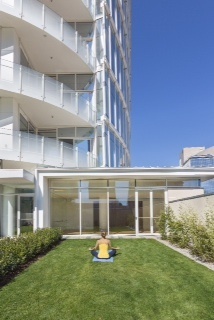 From the Terrace Lounge, where you can unwind with friends in a perfect “backyard,” to a private Zen garden to still the mind and refresh the spirit and a manicured Bocce Ball court, Museum Tower residents have every luxurious advantage at this picturesque urban green space. Even the pooches get first class attention when they play fetch in their own dog park. Feel like stretching your legs or rolling out a picnic blanket for a concert under the stars? Right across the street, the Klyde Warren Park serves as a vibrant front yard brimming with year-round pedestrian theater.